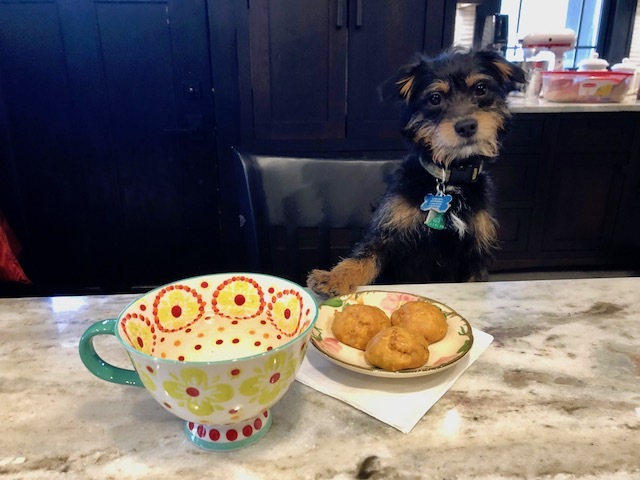 Have you ever sat down in the morning with a steaming cup of coffee and a scrumptious doughnut and, just as you are about to take a bite, you see your dog’s eyes of betrayal through the little doughnut hole? They sit longingly, wondering why they never deserve to have such a scrumptious treat. These naturally sweetened doughnut bites are the perfect solution. They’re smaller and healthier than a normal doughnut, but just as satisfying for your pup. Now you can both enjoy a delicious snack any day of the week. 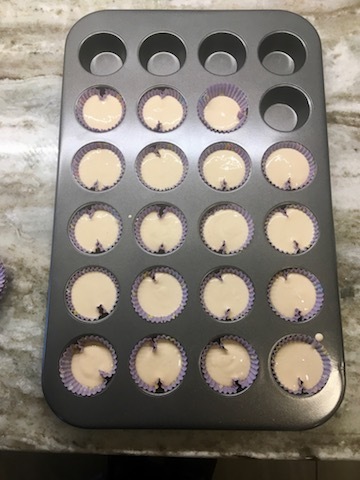 Preheat oven to 350 F. Line a baking tray with a silicone baking mat or parchment. Combine flour, baking powder, salt, and dried milk in a bowl. Set aside. Combine sweet potato, egg, oil, honey/molasses, and milk in a separate container and whisk until smooth. 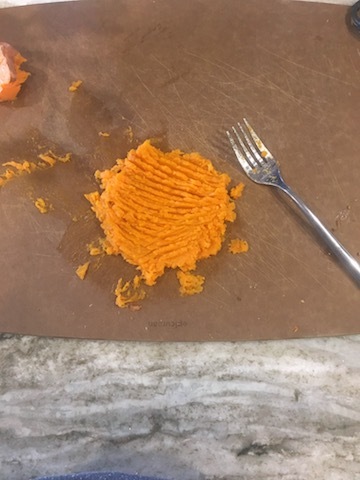 To get potatoes evenly mashed I removed the skins and press with a fork. This works well on a cutting board. You could also blend this together if you want to remove all lumps. Add the wet mixture to the dry and stir until combined. 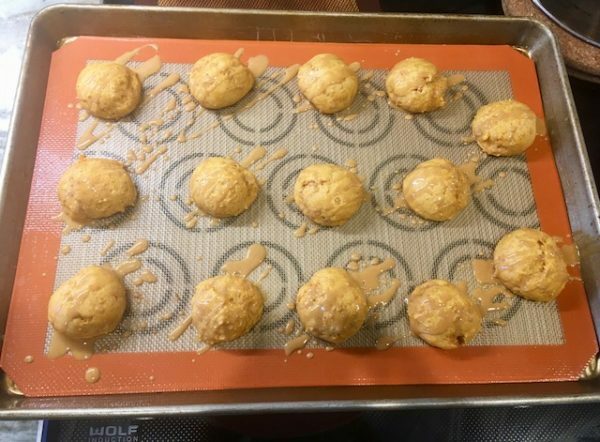 Using a small ice cream scoop or a spoon, place balls of dough on the baking sheet. These should be roughly the size of a small bouncy ball. Bake for 15-20 minutes, or until the tops are firm and dry and the bottoms have taken on a light brown color. Combine peanut butter and coconut oil in a microwave safe bowl and heat for 20 seconds or until coconut oil is melted. Stir and allow to cool for about five minutes. Once the glaze is cool and beginning to thick slightly, use a spoon to drizzle over the doughnut bites. These can be stored in the fridge for up to a week, but I am sure they won’t last that long, anyways! You will probably both have a hard time resisting these delectable bites. I’m a good ol’ Midwestern transplant that moved to Colorado for mountains and adventure. I love rock climbing, writing, and eating cookies. 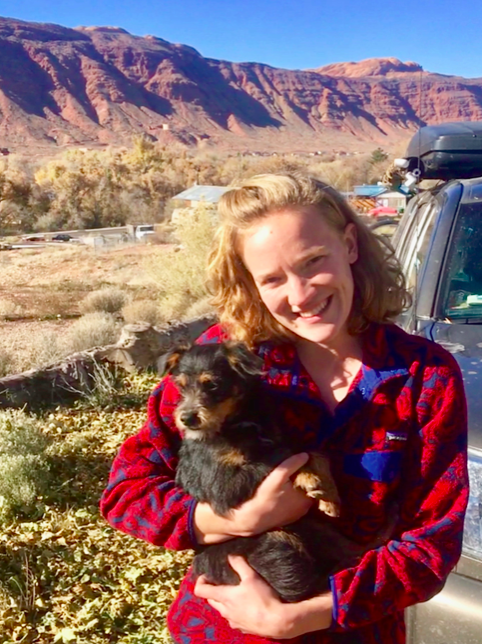 When I’m not on the side of a cliff you can find me walking my dog, Peanut, playing piano, and blogging about my climbing adventures on The Gobi Gazette.